'Local currency' offers retail incentives to aid neighborhood shops. The Bernal Bucks program offers retail incentives for shoppers to make their purchases in Bernal Heights, San Francisco. Spend it where you live. Or, to one local currency organizer, "Make the right decision, more often." Local currency supports smaller shops in an age of big-box megastores. And Bernal Heights seems a natural fit, too --no street lights or Starbucks. A few years ago, Bernal Bucks used replaceable stickers placed on $5 and $10 bills. When those bills were spent, the stickers were redeemed with retail incentives, like discounted purchases. "That was a bootstrap version that raised awareness," co-organizer Arno Hesse said. "Out of that came the more organized, present program." 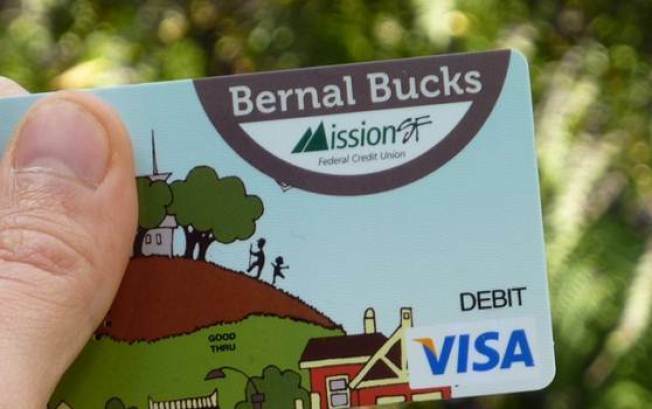 The new iteration of Bernal Bucks will launch on June 21 with a Visa Debit Card. They're throwing a street party to celebrate the launch, too. Mission SF -- a community development credit union -- is backing the initiative. The neighborhood is throwing a party to celebrate the launch, too, with music, tastings, food booths and, of course, some retailing on the summer solstice. Users can apply online for the card with Mission SF -- a community development credit union. "The credit union tracks how much is spent at the local businesses," Hesse, of the Bernal Business Alliance and a Bernal Heights resident, said. "It's similar to frequent flier miles. Then those purchases equte to Bernal Bucks, at a 5 percent rate." Bernal Heights is a "tight-knit community," making it So unique, well-heeled and entertaining shops, like Heartfelt, get the benefit of that extra retailing, and users get a discount. Local currency also helps smaller shops compete with corporations like Safeway or Costco on another level. It's a customer-recognition program that large chains have an easier time maintaining and leveraging. "We now stand a chance when competing with Safeway and Costco," Hesse said. The local money movement isn't limited to small neighborhoods or villages, either. The entire city of Baltimore, Md., has "Baltimore Green Currency" that actually has redesigned a series of bills with Frederick Douglass and Edgar Allen Poe on the $1 and $5, respectively. "We have been approached by other neighborhoods (in San Francisco, but Bernal is the pilot for this," Hesse said. Given the city's community-action vibe, local money has potential to catch on.